One of the highlights of my year is the annual road trip I take with my son for spring break. We take five or six days, and we head down to my grandpa’s in Arizona, taking detours along the way. One thing I’m adamant about, however, is that my son not spend the whole trip buried in a Nintendo DS, or using some other electronic gadget. Yes, I want to keep him occupied. But also don’t want him to think that a road trip means hours straight of electronic stimulation. I want him to be stimulated by the world around us. So I make sure to limit his “screen time” (just as I do at home), and provide other ways for him to be engaged enough that he doesn’t need to whine at me every hour. While I don’t want him to be completely buried in a book the whole trip (although I’d rather have him read Septimus Heap books the whole time instead of playing a video game), something to read can provide a welcome non-electronic distraction. In order to make the experience more applicable to our road trip, I like to provide reading materials that relate to where we are. National Forest Service pamphlets are great for when we go through those areas, as are informational books on the history of areas we drive through. When I was growing up, my mom had a book about the geography of Idaho. Whenever we drove in our state, we kept up with the geography, and looked for the features. With the informational books, I encourage him to talk about what he’s learned, and we discuss it right as we drive through it. It connects him to the landscape, and keeps him engaged. Plus, it’s quality “together” time for the two of us. One of the activities I prepared last year was a look-out-of-the-window scavenger hunt for my son. Since I am very familiar with the territory between our home and southern Arizona, I made a list of things that he might see outside the window at different stages of the journey. I gave him the list, and my old digital camera, and had him take pictures of prominent landmarks and buildings, common animals we might see along the way, and distinctive plants (like cacti) visible from the road. It kept my son busy for hours, and he had a lot of fun taking the pictures. I was careful to create separate scavenger hunts as well, spaced out so that he didn’t get bored by doing the same thing over and over again. This is a great activity that multiple children can do while you travel. Family road trips are all about the games — or at least they used to be. I remember playing the “alphabet game” growing up, looking for letters (in order) in signs. Another good game for road trips is “I spy.” These types of road trip games are fun to play, and they get everyone involved. Another fun game to play, especially as children get older, is an “identify the song” game. My parents used to play this with us. We’d turn on our own music mix, or even listen to the radio, and see who could name the song first, just by listening to the opening notes. My son is just old enough now that this game is something that would work with him. And, of course, once the song has been guessed, the whole family can sing along. Look for other games for children to play as well. 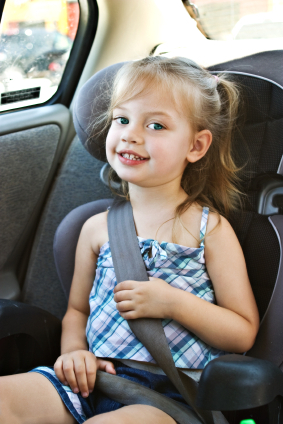 There are a number of travel games that the kids can play in the back of the car. Or you can play question games, where each child gets to ask you a question about your past — and you have to answer. Get to know you games keep everyone amused, while helping you draw closer as a family. I don’t mind having my son play with an electronic device for an hour or two each day while we’re road tripping. However, I don’t want him to miss out on the richness of the world around him. Otherwise, why travel at all? Creating ways for him to engage with me, and with the world around him, has a long-term impact while still keeping him from getting bored in the car. What are your favorite road trip games? We have a 3 year old and a 1 year old and drive from Indiana to Florida and Minnesota all the time. I couldn’t do it without having a DVD player in the car. Well, I could do it….but I would probably go crazy! Great ideas! We try to balance it, but like Holly said that DVD player is a must for some road trip sanity. We have a 6 year old and a 3 year old, and when we drive across country, it is to save money rather than fly. We use a combination of books, movies on the iPad, and games to keep them occupied. Driving through Eastern Colorado, Nebraska and Iowa, there are things to see, but they are far between. You can only look at so much corn. One of my favorite games as a kid on cross country trips was the license plate game. Keep a tally of the license plates from different states, and see if you can find all 50. (I never found Hawaii until I went on my honeymoon.) This kept us busy for hours, because anytime a car would pass us, we had to check out the plate. I love the idea of giving the child a camera to take pictures of things you know you will pass along the way. We have a trip to Iowa in the summer, and I am going to check out what there is to see along the way. Great ideas! Especially about the car ride scavenger hunt. It’s always important to keep kids busy while we travel, so I also do the same, come up with fun and interesting things to do and play with while on a trip. Thanks for the examples you’ve mentioned, I’ll be trying some of them the next time we go on a long road trip. Hi we don’t go on such long trips but we recently drove 11 hours in one day for a ski trip. We get book cd’s from the library and our boys (4&6) love it. They pick out boxed sets of books on CD and when we get tired of I Spy or the alphabet game, we put on a story. There are lots of classics such as Wind in the Willows, nearly all The Magic Treehouse books, Winnie the Pooh. It is a lot nicer to listen to a story than have them watching a DVD or playing on the iPad. I used to love playing road trip games. I don’t think electronics are inherently evil, and it does depend on the length of the road trip. Especially if it gets dark early or you, as parents, want some quiet time. But short road trips? There is no need for a game boy! I agree that electronic devices aren’t all bad; my son has a DS that he can play in the car. However, I do think it’s too bad if kids spend the ENTIRE trip watching movies or playing video games. They can do that at home.